We at Fern Drive and throughout the Fullerton School District take great pride in serving our families and community. We value your feedback and suggestions. When you walk into Fern Drive’s office, you will notice a green customer service sign with a QR code on it. Take some time to let us know how we are doing! Scan the QR code with the iPad and answer the brief questionnaire. Has a member of the staff provided great customer service? 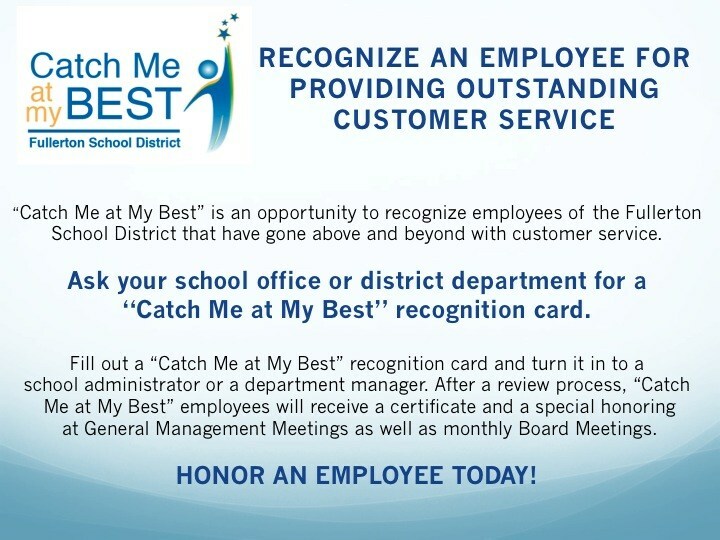 We have a District-wide program that recognizes staff that go above and beyond. Please recognize them by filling out a card next to our Customer Service Pledge! Help “Catch Us at Our Best!” For more information on FSD’s customer service policy, click below.